2.5 to 3.5 acres with access. We have 12 lots available in this area. Here at Wild Acres we are always thinking hunting. We are seeing a lot of deer in the front fields and along side the road. Wild Acres has over 400 acres of hunting area for exclusive use lease. Our lease is exclusive for the entire deer season starting in September for Archery including the Rifle season and through Blackpowder season in December. As far as we can detect we should have as good a deer herd this year as we had last. We harvested 31 deer last year with many more spotted. The biggest buck harvested was a 12 point and we are looking forward to another good harvest coming this fall. 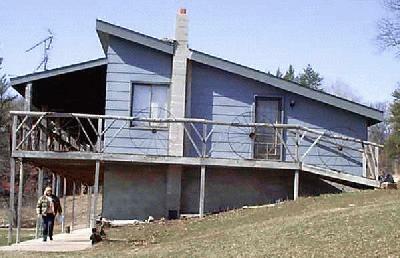 Each area will accomodate four deer stands. Safety is our first priority and each area is very well marked so there will be no question as to boundries, so encroachment will not be an issue. We also have several quaint cottages for rent, please contact us for details and availability.